You’d be forgiven for assuming the most powerful production MINI to-date would be a Coupe, or maybe even a Convertible, but it’s not. Witness instead this, the 2018 MINI John Cooper Works Countryman, a performance upgrade to the automaker’s most practical car. As well as seating for five and a healthy boot, there’s also 179kW under the hood. That’s courtesy of a 2.0-liter 4-cylinder engine with a more potent turbocharger. It’s good for 350Nm of torque between 1,450 and 4,500 rpm, and is paired with a special John Cooper Works exhaust system for better airflow and a more enjoyable soundtrack. Top speed is 235km/h. MINI opts for a six-speed short-shift manual transmission as standard, though you can opt for an 8-speed Steptronic Sport automatic – with paddle shifters – if you so prefer. That also comes with a Launch Control mode, with 0-100 km/h coming in 6.2 seconds. While that might not scare a Lamborghini, it’s 0.8 seconds faster than the MINI Cooper S.
The worked-over Countryman is also far more practical than the Cooper S, and indeed the old Countryman. It’s 6.7-inches longer than its predecessor, 2.9-inches of which go into the extended wheelbase; it’s also 1.3-inches wider. That means more rear legroom or, with the back seats folded down, the normally 17.6 cubic feet boot is expanded to 47.6 cubic feet. Those seats themselves are John Cooper Works sports seats with integrated headrests, and there’s a special multifunction steering wheel, an optional 8.8-inch touchscreen with navigation, and optional Harmon Kardon audio system. Another option is MINI Find Mate, a pair of Bluetooth tracking tags for keys or other objects. Parking sensors, keyless entry, a reversing camera, and auto-steering for parking can also be added, together with adaptive cruise control and auto-braking in emergencies. 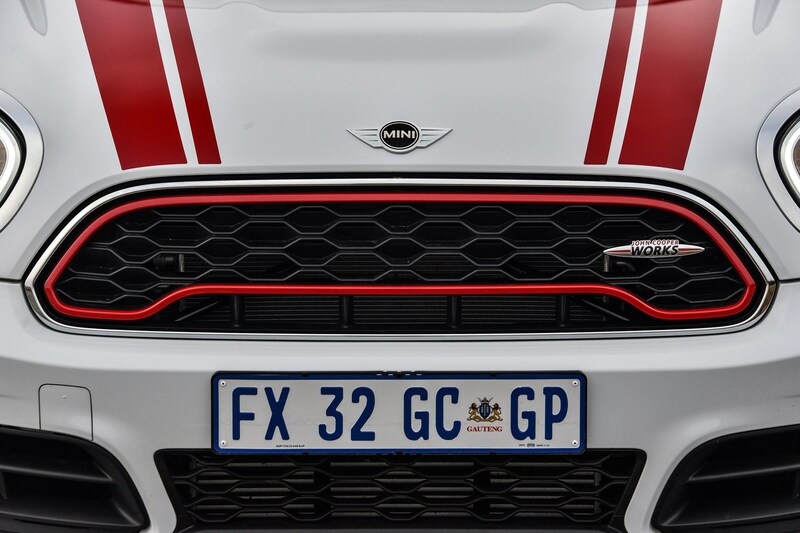 Outside, there’s the John Cooper Works Aerodynamic Kit, with bigger front cooling inlets, roof rails, a spoiler, and a hexagonal-pattern grille. 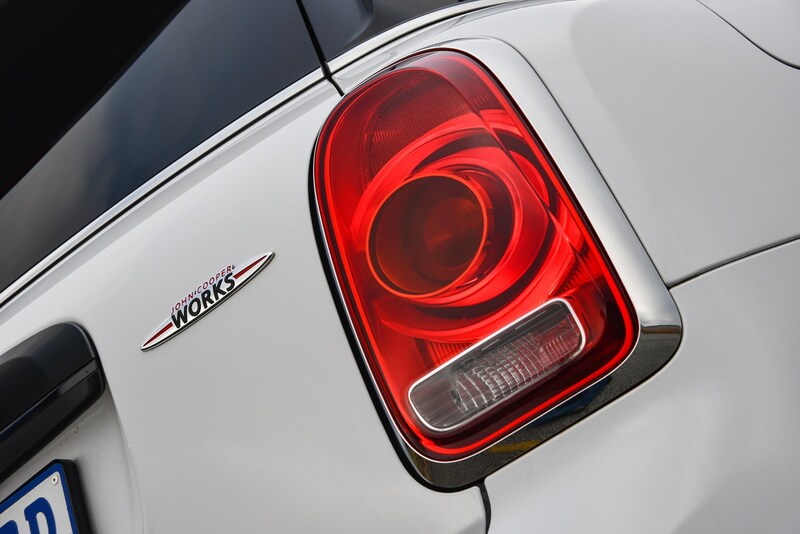 The John Cooper Works logo appears around the car, and there’s an exclusive Rebel Green paint finish available with contrasting Chili Red roof and mirror caps. 18-inch wheels are standard, with 19-inch versions an option; both come with 4-piston fixed-calliper disc brakes on the front wheels, with red trim. ALL4 all-wheel drive is standard too, biased in everyday use to front-wheel drive like the majority of the MINI line-up. Rear wheel power gets shunted in when an electrohydraulically controlled hang-on clutch activates; MINI says that happens within a fraction of a second. A drive mode switch toggles between SPORT, MID, and GREEN settings, affecting the electronically controlled dampers, auto transmission, accelerator and steering response, and other settings.